When we told our friends who have kids that we were going to adopt an older child from foster care several thought we were crazy. Not because they thought that we shouldn't actually adopt a child but because they were envious of our current custody schedule for our two biological kids, L and Z. Having an entire week alone, just the two of us, without kids seemed like a dream to our friends with kids. By adopting, all of that would change. We share custody of L and Z and have a schedule of one week with us and one week with their other parent, we divide the month equally in half between the two houses. Although it's been years since their father and I divorced I still feel sad in my heart on the transfer day when the children leave. I would much rather have them all the time than be without them for a week. But like most things the more you do it, the more use to it you become and it morphs into your new "normal". During the weeks when it was just my wife and I our schedules didn't change all that much; I still teach yoga in the evenings, we still have dinner at home and walk the dogs. Not really all that much changes in our day to day life except that it would just be the two of us. Right now in the midst of our adoption from foster care journey we now have a kid with us all the time...I miss my wife. I miss the time that we had just the two of us, totally uninterrupted. The freedom to have conversations without having to sensor ourselves because another set of ears are nearby. I miss reaching out to hold her hand and not having to share her with anyone else. I am mourning the loss of our time together that we once had but I'm also extremely grateful that we had so many years in the beginning of our marriage to have that time together to form our relationship. I know that we will always truly cherish that period of time. Like many parents bedrooms ours has become the "catch all" room. It is the place where stuff just ends up; the kid shirt that needs a button sewn on, the laundry in the basket that needs folding. With the dog crate in the corner and the ironing board propped against the wall behind the door the room is not the romantic setting seen in movies. And what my wife and I need right now is a personal oasis, just for us, to retreat to without kids to interrupt. We've lived in this house for three years and it's the last room to be decorated. I need it to become our sanctuary. Our retreat. The space that is only ours. 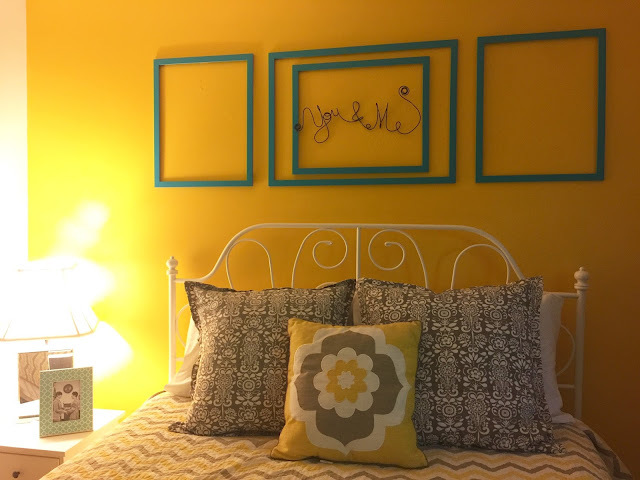 We put a bright, cheery yellow paint on the accent wall to remind us to live a happy life. Quilt and accent pillows were purchased and then I saw a dear friend posted these frames on Freecycle stating the color and that they did not come with glass or backings- perfect! Exactly what I had in mind to create an artistic piece over our headboard without having to spend any more money. My wife had the "you and me" made by an artist from Etsy years ago, it is the title of a song that we love by P!nk. Now I love walking into the room and seeing the turquoise frames on the bright yellow wall. It simply makes me happy and I need happy right now.